Number : Season 19, episode 5 of 7. Which One : The 1920’s ‘who’-dunnit. First UK Broadcast : 1 – 2 March 1982. Plot : The Doctor lands the Tardis in the 1920’s, right in the middle of a cricket game and a Miss Marple style murder – during a masquerade party. Whats good : A refreshingly non-alien Doctor Who story. Whats bad : It was a bit rushed – pacing and suspense wise, due to shorter running time. Could have been a 4 parter. Review With Spoilers : Black Orchid is an odd episode among Davison’s – and for that matter, all of the Doctor’s adventures. Not since Hartnell’s era, has Who been ballsy enough to dispense with aliens in favour of an Earth yarn. Black Orchid is a murder mystery story, set in the 1920’s – during a fancy dress ball. Thats not to say though it doesn’t have a touch of the weird about it. With the heavy breathing unidentified murderer, whose disfigurements – although seemingly steeped in some exotic disease or alien affliction. Actually turn out to have a very Earthly origin. Borrowing heavily from Miss Marple – with the Doctor as Poirot, we have a house full of secret passageways and a number of murders of servants and disappearing bodies. 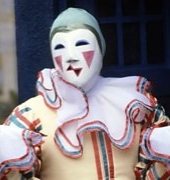 The Doctor is accused of murder, when the Murderer borrows the Doctor’s fancydress costume and carries out a killing. For which, the Doctor is later accused and arrested. Davison impresses in a game of Cricket aswell. By bowling out a batsman and hitting the stump on his first throw (if the trivia around this episode is to be believed). Black Orchid is another short 2 part episode, which is a little rushed – pacing wise. Considering the possibilities on offer here. It would have been a good contender for a 4 parter, as there is enough going on here to stretch it out and build more suspense. However, it is still effective and different though, in this shorter form. Considering the viewer is conditioned to expect an alien angle to this story. Its refreshing that for a change, there isn’t one provided. Which might sound wrong for Who – but works. The companions get a bit more involvement in this, especially Nyssa who gets to play two parts – Nyssa and Ann Talbot. An interesting diversion from the alien stories.